We all catch a cold, come down with the flu, sprain a muscle or two, even break a bone now and then. But it’s still important to keep up with your drawing habit. I had a particularly rough time keeping up my daily practice the past few weeks. A cold went to bronchitis and my attitude went to mush as well. I was missing the final days of a glorious fall (cool temps, mostly dry weather), perfect for cycling. I found initially that the coughing was so bad it was frustrating to work with my regular tools and keep any consistency. Normally, regardless of how I feel I’m able to sketch, but this bout knocked me down hard for two weeks. I missed three days sketching, then did an anemic sketch, missed another three days; you get the idea. I could tell that this bout of bronchitis was going to continue for some time (four weeks and counting). I wasn’t going to miss any more sketching. I needed something to work against the listlessness. Here are a couple tips if this happens to you. 1. Change tools—Pick something that you haven’t used before or haven’t used for awhile and work with that. Your expectations will be low, not just because you’re under the weather, but because you aren’t up to speed on the tool you selected. I had not sketched with my parallel pen for some time. (You can see some of my parallel pen sketches from 2014 here, and also in this post. You can see my fun Red Bird Series starting here and going for five posts—all parallel pen sketches helped along with a little bit of water (on the water-soluble ink). 2. Change size/scale, either of your paper or your sketch. Here’s an example of that with another parallel pen sketch done in a book smaller than I typically use. Additionally you can simply change the paper that you work on. Cut some loose sheets of paper that you have on hand down to a size you want to work in. 3. Go out anyway—If you’re so sick that you can’t do your normal sketching sessions like going to the zoo or getting to life drawing, but you’re well enough to safely drive, go out any way with your journal and pen and sketch when you stop on your errands. I did the above page spread of sketches last Friday when the coughing had subsided to “only when I try to talk” and I was safe and alert enough to drive. I placed an order for take out at one of my favorite restaurants (The Everest on Grand!) and while I waited for the order I swung over to Wet Paint (also on Grand Ave.) and picked up a few essentials I needed for ongoing projects. At Wet Paint I had a nice chat about one of the staff member’s upcoming show (after warning him that I was going to stand well away from him so I didn’t cough on him). 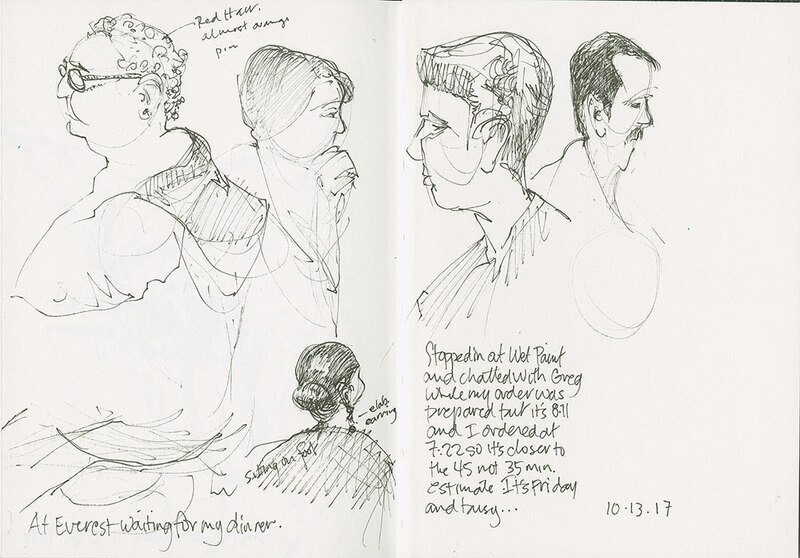 Then it was off to the restaurant for my food where I was able to sit in the waiting area, silently, without coughing, and quickly sketch some of the diners. Moving the pen loosely about the page, working quickly in case they finished their meals and left, helped energize me. I also found things to sketch in the parking lot of the CVC when I picked up my prescriptions. If you already have a drawing practice which makes use of those little spaces of time one can find when running errands (and I strongly suggest that you develop this approach) then it’s an easy thing to continue the sketching when you’re ill.
You are simply putting yourself in a situation where sketching is called for and habitual, and then giving in to the sketching habit, regardless of how you feel. This is one of the reasons it’s important to have a drawing practice that makes drawing a habitual part of your day. Sure, you might miss a day or two when you are sick, but you don’t have to miss many days. You can still stay in the stream of sketching. 4. If you have a regularly scheduled sketching time, sit down at that time and sketch anyway. That’s the “fake it until you make it” strategy, which is surprisingly fruitful, because as you start moving the pen across your paper you will find the habit rallying a little bit of strength and you might surprise yourself with what you get down. Regardless of the result you’ll feel glad you kept the appointment. Perhaps a bit of doodling allowed you to think and plan what you might want to work on when you’re well? Or it just provided a nice short break to remind yourself that things will be “normal” again. 5. Practice Letting Go of Perfect—when you’re ill it’s probably a given that you aren’t going to be as precise (because of the coughing???) or as clear in your thinking as you might be sketching when well. There might be factors of listlessness from fever that keep your attention from focusing. 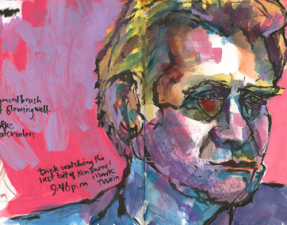 This is the perfect time to practice experimenting and simply sketching without expectations. This will help you when you’re back to 100 percent as well. One really quick way to let go of perfect is to tell yourself you’re doing “studies,” or to work only with thumbnail sketches. Thumbnails have the great advantage of being small, quick to do, and something that only has to be “readable” by you. So letting go of perfect is easy when you’re working on thumbnails because you’re working with possibilities not completed pieces. Don’t know what a thumbnail sketch is? It’s a small, quick sketch made to work out composition, values, cropping, negative space, all those things that go into making a final piece. You are working quickly and trying out a number of different ideas. I tend to think of my journals as a series of giant thumbnails. When I’m planning paintings I tend to spend time pushing out several thumbnails so I think the possibilities through and don’t waste time. And with watercolor thumbnails also allow me to make a painting plan. But the main thing thumbnails do by their very nature, is force you to give up the idea that they need to contain perfection—they are simply searching. 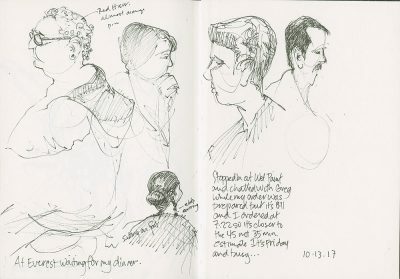 Life is rarely a perfect thing, and it’s good to remind ourselves to always be present and make time for our sketching which yields so much benefit in our larger lives. Remember “completed” pages, regardless of whether or not they are “finished,” will do much to improve your general attitude. P.S. And yes I realized after I’d saved the post and couldn’t change the permalink that my list grew beyond two things!!! I could have kept going. Sorry you’re feeling under the weather… great advice for the upcoming flu season. Elaine, I still haven’t had my flu shot (can’t have it while you’re sick with your lungs involved), so I am just gnawing off my lip hoping I can get one before I catch the flu!!! One year I got a cold, was well for two weeks caught the flu, got well got a cold and bronchitis and then ended up with pneumonia. I don’t want that to happen again. I typically have my shot BEFORE THE FAIR~~~ I’m the first in line at the allergist’s. But this year it just sort of skipped off my radar. Keep your fingers crossed for me. 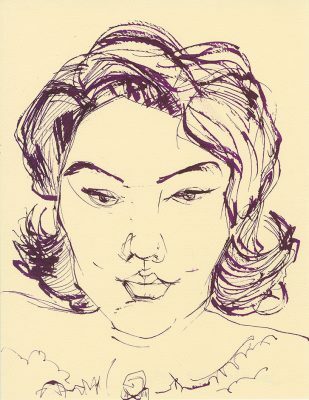 Hope you’re well and sketching. I think your sketches turned out beautifully, illness or not so I’m glad you pushed through. You are always an inspiration. Thanks so much Ana for your comments on my art and the post. I appreciate it. Thank you Roz for showing us how we can draw/create even when we are sick, and having it be part of our life, not something that has to have the perfect time or place! Sorry you are sick, hope you are feeling better soon! Thanks Cathy. I’m feeling a little better every day and have started watercolor sketches again because I’m not coughing so much! This is timely for me, though my issue is a bit different. I will have surgery on my dominant hand in a couple weeks. Have thought to use that as an “excuse” not to draw. But NO! You have inspired me! I’ll attempt some non-dominant hand drawing and see what happens. After all, the same brain and eyes will be at work. In fact, I may start this idea immediately as my “bad” hand is so painful now anyway. Thanks, Roz! Buffie surgery isn’t an excuse as you have already decided. NO! I have friends and students who have used their non-dominant hand. Also be sure to ask your doctor what physical therapy is available so that you can heal after surgery and get back full mobility. If you have a photo or tablet with a drawing app you could also try just using your finger and drawing from your shoulder—it’s better to to that anyway. Or when possible to start using the dominant hand again, start with charcoal and loose open, large strokes. Do a little drawing every day regardless of which approach you take. It will come back! Do you have a favorite size of parallel pen for your sketches? Do you use the Con50 converter and permanent ink. Changing up the sequence is a great idea. I enjoy your art and writings. I don’t have a favorite size. I don’t have them all. I was sick when I did this (and some others that aren’t posted here) and grabbed the first one I could find which was the 3.8. I think if you follow the links to the other posts which show some of these types of sketches you’ll find out more about which one I was using, but if not, it was probably the 6. I tend to use the biggest tool I can find. I don’t use a converter. I was told converters wouldn’t fit in this pen. But it doesn’t matter to me because I like the water-soluble ink that Pilot sells for them. 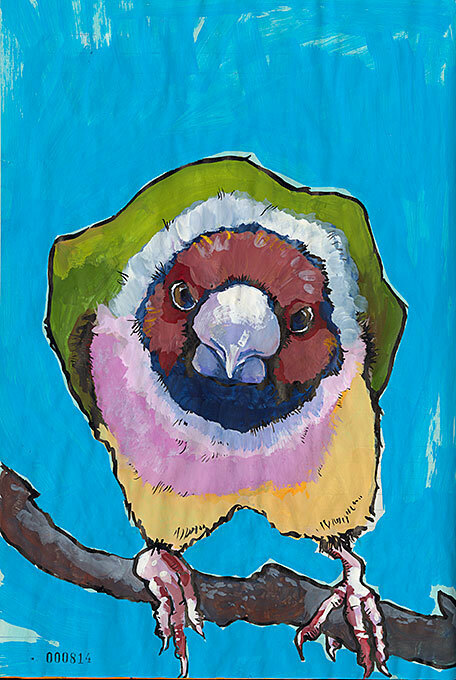 If you look at the links to my finch pieces in particular you’ll see why I like to use the water-soluble ink. And yes this ink is fugitive, so I scan right away and my digital is my “original” if there is fading. I have friends who don’t use a converter but also simply put ink and paint in the barrel of their pen. That works for them. So glad you enjoy the blog. Thanks for the good wishes. I’m feeling a little better every day and coughing a lot less than when I did these sketches in today’s blog piece! Thanks so much. I actually started painting small watercolors on Monday. So I have less coughing and more attention span! And a slightly better attitude! Sorry to hear you’re sick Roz, and wish you to get better very soon! This kind of posts are precious and I always bookmark them because they show us a way to deal with adverse circumstances, which can arise in so many ways. It took me several weeks to recover from a short interruption of my drawing practice due to travel in August! What worked for me then was setting a timer every day and sketching anything for 30 minutes. At first, I found it a very long time. I love the idea of sketchbook pages as a giant thumbnails. It means that every page contains many virtual sketches, to be sketch one day in the future. No need to worry about inspiration. Great! Thanks so much Benedicte! I am so glad that after the short disruption you found a great way to get back in the flow. I think setting a timer and just getting down to it is excellent! And yes, if your journal/sketchbook is full of giant thumbnails the pressure is off. Keep working. I coughed my way thru most of last April. Whatever it is that we are getting–doesn’t have a name yet–I hope to NOT get it again. My lung doctor hopes I don’t get it again. My doctor didn’t HAVE any flu shots when I had my appointment last month, so I am also hoping I find a shot before I get the flu. I had a drawing pad and a few sharp pencils handy when I was coughing and not asleep. I hope you get the flu shot before another virus finds you!!! Keep sketching. Consider getting 2 flu shots spread apart by 3 months. Flu season can last 6 months where I live. One flu shot may not cover you for the whole season, the immune response wears off. The quadrivalent flu vaccine has 4 different kinds of flu strains in it. That’s an interesting approach. I will have to ask my doctor about this. Thanks for the suggestion.